Display expands rearward vision by 300 percent. 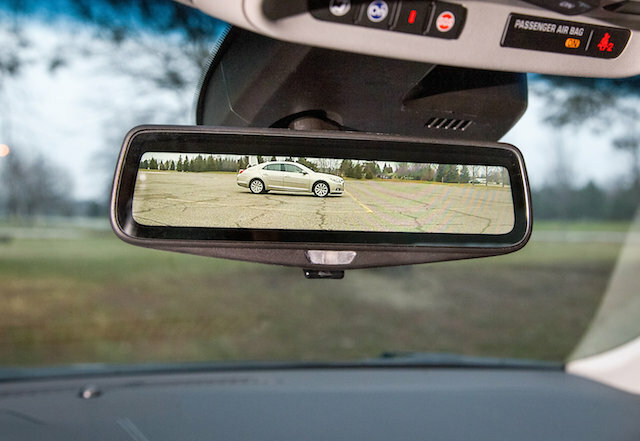 The CT6’s rear view mirror as it provides video streaming. One of the most anticipated new cars from Cadillac is the CT6, a high-end full-size sedan set to debut in late 2016. Parent GM has promised to elevate Cadillac to the top of the mass-produced luxury segment and the new model will help move it in that direction. We’ve been learning a little bit here and there about the sedan that will take on the likes of the BMW 7 Series, Audi A8, Lexus LS and Mercedes-Benz S-Class, but much of those details have been shrouded in relative secrecy. Last week, Cadillac shared some news to pique interest in the CT6 and that is the inclusion of a high-resolution streaming video to the function of the rear view mirror. Cadillac says that the technology will eliminate the usual sight obstructions drivers face, including front and rear sitting passengers, their head rests, as well as the front, center and rear pillars. Cadillac claims that the video will provide a vantage point for drivers similar to what is experienced when operating a convertible with its top down. “In addition to the increased field of view, the technology eliminates any rear seat, rear pillar or passenger obstructions, allowing the driver an unimpeded view of the lanes behind and traditional blind spots,” explained Travis Hester, Cadillac CT6 executive chief engineer. Utilizing a camera with a high dynamic range, the video feed will reduce glare and permit a sharper image in low-light circumstances. That makes for a marked improvement over automatic dimming rear view mirrors. The video will show up within the mirror and offer a 1280- by 240-pixel TFT-LCD display with 171 pixels per inch and combine that with an HD camera specifically designed to meliorate rear view lane width and to magnify low-light situations. Rain and other water conditions can wreck even the best intentioned plans. Unlike most rear view cameras that become clouded or otherwise obscured due to water, the Cadillac CT6 will make use of a water-shedding hydrophobic coating, applied to the camera to keep it clean under all driving circumstances. This is important, because under foul weather conditions, the benefit of streaming video would likewise be eliminated. Cadillac acquired 10 patents for its innovative streaming video technology. One patent was received for the streaming video mirror itself; the other nine were for video processing, including glare reduction, dewarping and the camera hardware design. Rest assured, if you buy a CT6 and decide at any time that you don’t want to use the streaming video you will be able to deactivate same by flipping a toggle found on the underside of the rear view mirror. The unit will then immediately transition to an electrochromatic rear view mirror. The CT6 is a rear-wheel drive model with optional all-wheel drive. The sedan will make use of lightweight materials as well as new body construction techniques to improve vehicle drive dynamics and safety with the added benefit of reducing fuel consumption. It will be built upon an all-new vehicle architecture separate from its other car lines. When the CT6 debuts, it will also begin a change in Cadillac’s naming convention. All future car models will adopt the new nomenclature when revised models are introduced. This will include the current ATS, CTS and XTS. Crossovers and sport utility vehicles will also gain new names and the transition should be completed by about 2020. Photo courtesy of GM Corp.